It’s always nice when I can report a little good news for Puget Sound recovery. For the second year in row, we’ve seen more shoreline bulkheads ripped out than new ones put in. 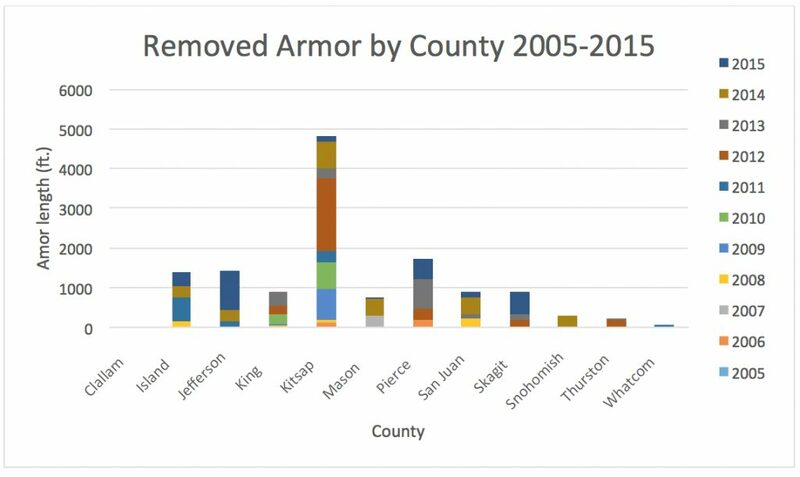 After officials with the Washington Department of Fish and Wildlife completed their compilation of permit data for 2015, I can say that 3,097 feet of old armoring were removed, while 2,231 feet were added. Scientific evidence is mounting that bulkheads cause considerable harm to the shoreline environment, affecting salmon and many other species integral to the Puget Sound food web. 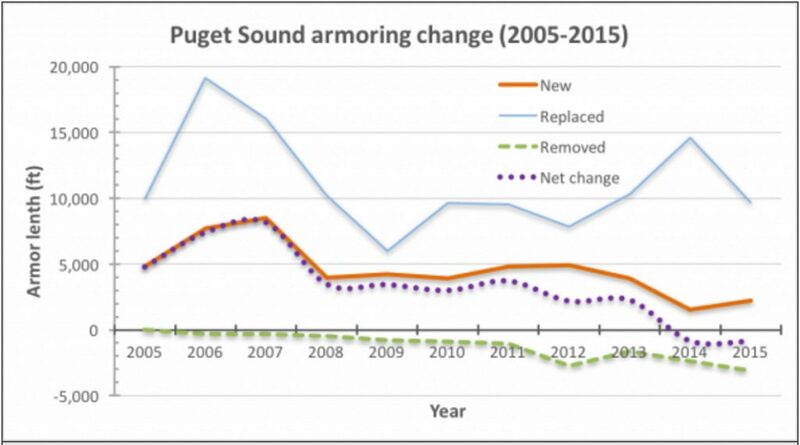 As I pointed out in a story published this week in the Encyclopedia of Puget Sound, we cannot say whether the armoring removed has restored more valuable habitat than what was destroyed by new structures. But we can hope that’s the case, since state and federal governments have targeted restoration funding toward high priority habitats. They include shorelines used by forage fish, such as surf smelt and sand lance, as well as feeder bluffs, which deliver sands and gravels needed for healthy beaches. 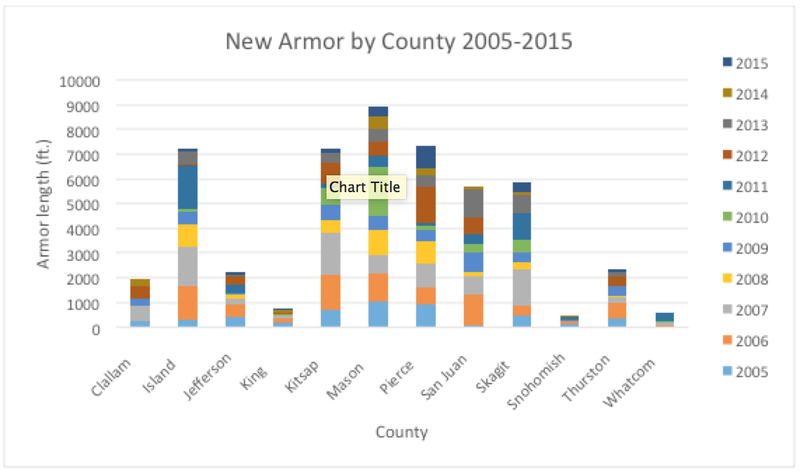 One problem with the data, which officials hope to improve in the future, is that we don’t know whether the new bulkheads being built are the standard concrete or rock bulkheads or the less-damaging “soft-shore” projects. Unlike hard armor, soft-shore projects are designed to absorb wave energy by sloping the beach and placing large rocks and logs in strategic locations. It’s not a perfect solution, but it is a reasonable compromise where armoring is truly needed. Dave Price, restoration division manager for WDFW, said he was encouraged by the amount of bulkhead removal versus construction, but he acknowledged that a lot more work is needed. The answer is to convince waterfront property owners that the problem is real and to enlist their help in boosting habitat over time. The Shore Friendly program is part of the effort. Sheida Sahandy, executive director of the Puget Sound Partnership, said the issue is not about government requiring these changes but about people deciding that they want more natural conditions where possible. “We should frame this so that people see the possibility of having a nice beach, a place where you can walk down and put your feet in,” she said, adding that people who have installed soft-shore protections often rave about their easier access to the shore.